The Simple Way To Check For Mold. 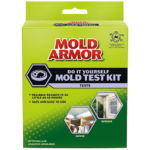 The Mold Armor Do-It-Yourself Mold Test kit lets you test for the presence of mold in just 48 hours. If you find mold present in your test dish you can mail it in and receive a lab analysis to determine the mold type. Order the lab analysis by selecting the Optional Lab Analysis button below and you will receive results in 2-3 weeks. The cost is $40 and only credit cards are accepted. Please enter your Barr Order ID# on the Information Form included in the Mold Test Kit, which is used as your proof of purchase for the lab analysis. 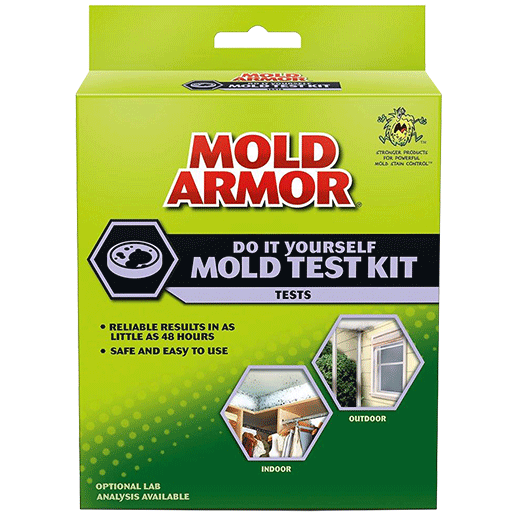 There are 3 testing methods to tell if you have a mold problem. 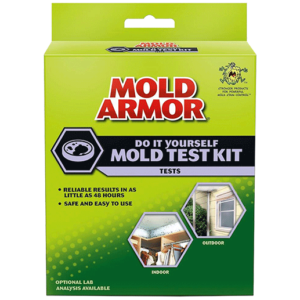 The indoor air quality test method tests the indoor air for mold spores. The air conditioning and heating sampling method tests the air from a forced air heating and air conditioning unit. The surface sampling testing method is used if you already have mold growing and want to know the type of mold it is. Some types of mold are more dangerous to your health so it is important to know the type of mold you have. You must send a mold sample to our lab for analysis and we will tell you the mold type within 3 weeks. Remove the petri dish from the plastic bag and place it on a level surface with the lid side up. Remove the lid of the petri dish and pour the mold growth medium (potato dextrose) into the dish bottom. Replace the lid and swirl gently until the bottom is completely covered. Allow to gel for one hour on a level surface. Place the prepared petri dish on a level surface in the location where you want to test for mold. Remove the lid of the petri dish and leave it open to the environment for 1 hour. After one hour replace the lid and allow to incubate for 48 hours. If there is no mold present within 48 hours, re-check the dish at 72 hours and 96 hours to be sure that no slow growing mold were overlooked. If mold growth is present after the incubation period, you may send the petri dish to our lab for analysis on the type of mold present. If no mold is present after 96 hours then no mold was detected. Mold can also come from your heating and air conditioning unit. To test, locate the air exhaust vent that is furthest away from the furnace. After preparing the petri dish, remove the lid and tape the open dish against the open-air vent. Close all of the remaining air vents that are on the system. Turn the system fan on high for a 10-minute period, allowing forced air to hit the inside surface of the petri dish. After 10 minutes remove the petri dish, replace the lid, and allow to incubate for 48 hours. If no mold is present after 48 hours, re-check the dish at 72 hours and 96 hours to be sure that no slow growing mold were overlooked. If mold growth is present you may send the petri dish to our lab for analysis on the type of mold you have. If no mold is present after 96 hours, then no mold was detected. Locate the visual mold growth. Take the enclosed sterile swab and wipe the tip across the visual mold growth. Be sure the mold adheres to the swab. 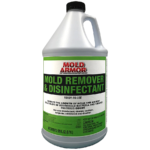 Open the small bottle of mold growth medium. Insert the swab with mold on it and stir it in the mold medium. Pour the mold growth medium into the petri dish. Allow to gel on a level surface for 48 hours. IN ORDER TO PROVIDE YOU WITH THE TYPE OF MOLD GROWING YOU MUST SEND THE PETRI DISH WITH THE MOLD GROWTH TO OUR LAB FOR ANALYSIS. Some types of mold, like toxic mold, are more dangerous to your health than others. It is important to determine the type of mold you have growing. To do this you will need to mail the mold sample to our lab for analysis. The cost for the analysis is $40.00 and you will receive results within 3 weeks. Will this test tell me if I have mold in my home? Yes, it will tell you if you have mold but it will not identify the type of mold that you have. To find out the type of mold you must return the lab analysis section which costs $40. Yes, we cannot accept checks or money orders. Will I get an analysis report for this? Yes, if you pay for the lab test you will get a complete report from an accredited Lab. This date on my box says it’s expired, can I still use it? The date is manufacturing date not the expiration date. These kits do not expire. The “Directions for Use” are included to help you better understand our product. However, they do not provide you with all of the information needed to use the product safely and effectively. Prior to using any of our products, you should always read the entire label including all cautions. The contents of this website, such as text, graphics, images, and other material contained on this website (“Content”) are for informational purposes only. Although Barr believes it to be accurate, we make no representation, warranty, or guarantee, and disclaim any liability with regard to the accuracy or completeness of the information, or the results of any action taken by anyone who relies on the Content. The Content is provided on an “as is” basis. 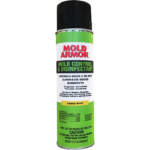 The Content is not intended to be a substitute for professional advice, diagnosis, or treatment of any mold or moisture problems. Never disregard professional advice or delay in seeking it because of something you have read on this website. Reliance on any information provided by Barr, Barr employees, others appearing on this website is solely at your own risk. Always seek the advice of your physician or other qualified health provider with any questions you may have regarding a medical condition. NEVER DELAY MEDICAL TREATMENT WHILE AWAITING THE RESULTS OF ANY REMEDIATION. If you think you may have a medical emergency, call your doctor or 911 immediately.